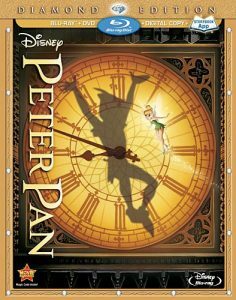 Blu-Ray Review: ‘Disney’s Peter Pan’!!! It was so great to see this newly remastered ‘Peter Pan’ from Disney. The image is pristine and is the best this animated film has ever looked. Plus, Disney decided to give it a 7.1 lossless DTS-HD audio mix, which just sounds amazing. I can’t believe it has been since 1953 since we first watched this animated instant classic capture the hearts of many. It’s truly remarkable to have this on blu-ray. This version is my favorite out of the countless ones that have come out over the years. The animation is amazing, the voice work is incredible, and the story itself is one tof the best of all time. Maybe it’s a nostalgia thing, as I grew up watching this film at least twice a week growing up, but it hits close to home every time I watch it. This is a must have. Disney’s ‘Peter Pan’ comes with an exquisite 1080p transfer and is presented in 1.33:1 aspect ratio. This just looks stunning on all accounts. This animated film is 60 years old and while the animation has that 50’s feel, today’s technology and engineers have cleaned it all up and made the film like new. It was a complete new experience watching this. All of the grain and dirt has been removed, which were on some of the previous releases. The colors are very strong and pop. The color fills are smooth and sharp. The blacks are deep and inky as well. The blues and greens of the film truly do shine vibrantly on the screen. This is one hell of an HD transfer. Disney did a wonderful job here. ‘Peter Pan’ never looked this good. This release comes with an all new and boasting lossless DTS-HD 7.1 audio mix as well as an original mono track. Listening to this in 7.1 was a thrill. Dialogue was crystal clear and easy to understand with the directionality of the mix sounding flawless. The explosions, yells, and action sequences give the speaker system a very good hard work out as it all sounds loud and uses each surround perfectly. I’ve never heard ‘Peter Pan’ sound this good before. Amazing audio transfer here. Deleted Songs and Scenes (15 mins.) — Here are some deleted storyboard concepts and art that could have been. There are also two deleted songs here too. Backstage Disney (65 mins.) 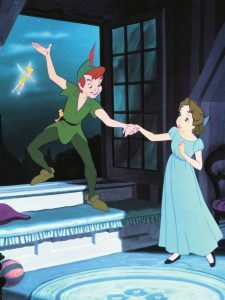 — “You Can Fly: The Making of ‘Peter Pan’,” “In Walt’s Words: Why I Made ‘Peter Pan’,” “The ‘Peter Pan’ that Almost Was,” “Tinker Bell: A Fairy’s Tale,” and “The ‘Peter Pan’ Story”, are the five featurettes showcased her, which are the extras from the previous DVD release. Introduction by Diane Disney-Miller (2 mins.) — Here, Diane (Walt’s daughter) intros the film and talks about how much her father loved the work on this film. Music & More (17 mins.) — Here you get a few songs from the film as well as a music video or two. Nothin really to see here unless you’re just dying to watch music videos for a kids movie. Growing Up with Nine Old Men (41 mins.) — This is a cool feature where the children of the original animators (who are all dead now) talk about their father’s work and history with Disney. This ‘Peter Pan’ release is top notch. The video and audio are all demo worthy and it the flick never sounded or looked better. The extras or okay, but this Disney release is definitely one to own. Highly recommended!! This entry was posted on Wednesday, February 6th, 2013 at 10:01 pm	and is filed under Film, News. You can follow any responses to this entry through the RSS 2.0 feed. You can skip to the end and leave a response. Pinging is currently not allowed. « ‘Game Of Thrones’ George R.R. Martin Inks Deal with HBO To Develop New Projects!! !